I often liken human brains to desk top computers, without the rigid logic and strict protocols. Data input > data processed > data output response. It's the same principle but unlike computer systems, each brain seems to use its own unique operating system - and so individual responses to the same events might be the same (e.g. an emergency situation in a theatre would generate a common desire to evacuate or die) or it may be totally different in other situations (e.g. stick me into a crowd of people watching rugby league and I would be the only person whose brain was sending out signals to evacuate or die of boredom). I continue the computer analogy when I think of religion. I see religion as a analogous to a computer virus. The religion virus is so powerful, children are infected by their parents and the particular religion stays with them throughout their life. Grown men and women, still retaining the imaginary belief that their benevolent god is the one true god and that she responds to their thought prayers and will grant them everlasting life. In most developed countries, the religion virus is declining. The more educated a society is, the less religious it is likely to be. 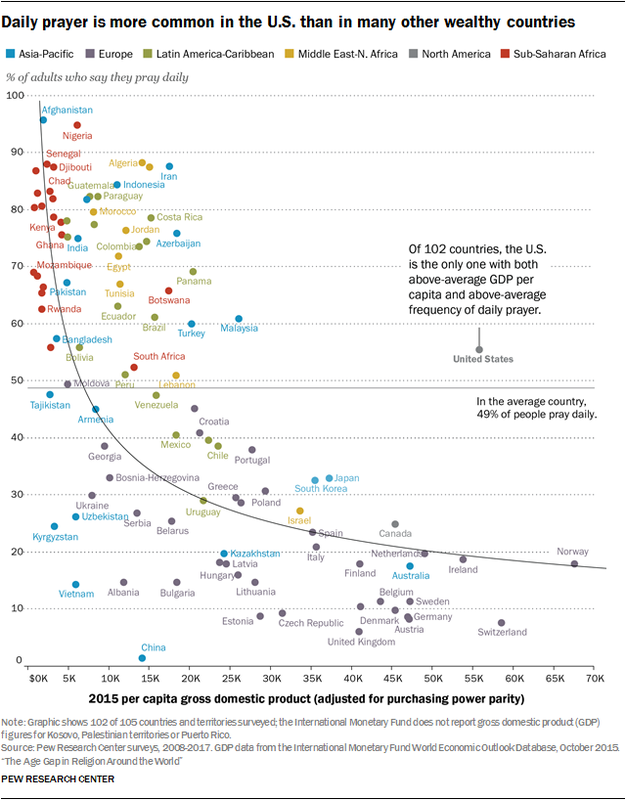 Apparently, America is the most religious wealthy country in the world (as measured by per capita GDP) - and 55% of them pray to their god on a daily basis. America, the most powerful country in the world - one of the richest too - with its advanced technology and its immense scientific knowledge, still believes in Santa Claus! From the President and Congress down to its educated and uneducated population, the anti-virus software is not working over there. The con-men and scammers are winning.